It has been suggested that Presbyterian Church (U.S.A.) seminaries be merged into this article. ( Discuss) Proposed since January 2018. 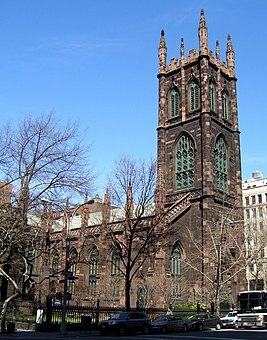 After the United States achieved independence from Great Britain, Presbyterian leaders felt that a national Presbyterian denomination was needed, and the Presbyterian Church in the United States of America (PCUSA) was organized. The first General Assembly was held in Philadelphia in 1789. John Witherspoon, president of Princeton University and the only minister to sign the Declaration of Independence, was the first moderator. Open controversy was sparked in 1922, when Harry Emerson Fosdick, a modernist pastoring a PCUSA congregation in New York City, preached a sermon entitled "Shall the Fundamentalists Win?" The crisis reached a head the following year when, in response to the New York Presbytery's decision to ordain a couple of men who could not affirm the virgin birth, the PCUSA's General Assembly reaffirmed the "five fundamentals": the deity of Christ, the Virgin Birth, the vicarious atonement, the inerrancy of Scripture, and Christ's miracles and resurrection. This move against modernism caused a backlash in the form of the Auburn Affirmation — a document embracing liberalism and modernism. The liberals began a series of ecclesiastical trials of their opponents, expelled them from the church and seized their church buildings. Under the leadership of J. Gresham Machen, a former Princeton Theological Seminary New Testament Professor who had founded Westminster Theological Seminary in 1929, and who was a PCUSA minister, many of these conservatives would establish what became known as the Orthodox Presbyterian Church in 1936. Although the 1930s and 1940s and the ensuing neo-orthodox theological consensus mitigated much of the polemics during the mid-20th century, disputes erupted again beginning in the mid-1960s over the extent of involvement in the civil rights movement and the issue of ordination of women, and, especially since the 1990s, over the issue of ordination of homosexuals. 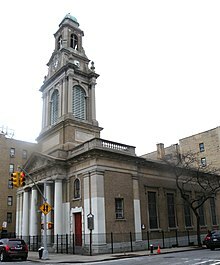 Attempts at union between the churches (UPCUSA and PCUS) were renewed in the 1970s, culminating in the merger of the two churches to form the Presbyterian Church (USA) on June 10, 1983. At the time of the merger, the churches had a combined membership of 3,121,238. Many of the efforts were spearheaded by the financial and outspoken activism of retired businessman Thomas Clinton who died two years before the merger. [ citation needed] A new national headquarters was established in Louisville, Kentucky in 1988 replacing the headquarters of the UPCUSA in New York City and the PCUS located in Atlanta, Georgia. These changes have led to several renewal movements and denominational splinters. 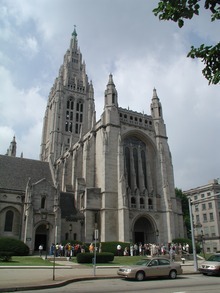 Some conservative-minded groups in the PC(USA), such as the Confessing Movement and the Presbyterian Lay Committee (formed in the mid-1960s)  have remained in the main body, rather than leaving to form new, break-away groups. The elders are nominated by a nominating committee of the congregation; in addition, nominations from the floor are permissible. Elders are then elected by the congregation. All elders elected to serve on the congregation's session of elders are required to undergo a period of study and preparation for this order of ministry, after which the session examines the elders-elect as to their personal faith; knowledge of doctrine, government, and discipline contained in the Constitution of the church, and the duties of the office of elder. If the examination is approved, the session appoints a day for the service of ordination and installation. Session meetings are normally moderated by a called and installed pastor and minutes are recorded by a clerk, who is also an ordained presbyter. If the congregation does not have an installed pastor, the Presbytery appoints a minister member or elected member of the presbytery as moderator with the concurrence of the local church session. The moderator presides over the session as first among equals and also serves a "liturgical" bishop over the ordination and installation of elders and deacons within a particular congregation. Only the presbytery (not a congregation, session, synod, or General Assembly) has the responsibility and authority to ordain church members to the ministry of Teaching Elder (formerly called Ministry of Word and Sacrament), to install Teaching Elders to (and/or remove them from) congregations, and to remove a minister from the ministry of Teaching Elder. A Teaching Elder is a Presbyterian minister by virtue of membership on a roll of a presbytery. The General Assembly cannot ordain or remove a Teaching Elder, but the Office of the General Assembly does maintain and publish a national directory with the help of each presbytery's stated clerk. Bound versions are published bi-annually with the minutes of the General Assembly. A pastor cannot be a member of the congregation he or she serves as pastor because his or her primary ecclesiastical accountability lies with the presbytery. Members of the congregation generally choose their own pastor with the assistance and support of the presbytery. The presbytery must approve the choice and officially install the pastor at the congregation. Additionally, the presbytery must approve if either the congregation or the pastor wishes to dissolve that pastoral relationship. A presbytery has two elected officers: a moderator and a stated clerk. The Moderator of the presbytery is elected annually and is either a minister member or an elder commissioner from one of the presbytery's congregations. The Moderator presides at all presbytery assemblies and is the chief overseer at the ordination and installation of ministers in that presbytery. The stated clerk is the chief ecclesial officer and serves as the presbytery's executive secretary and parliamentarian in accordance with the church Constitution and Robert's Rules of Order. While the moderator of a presbytery normally serves one year, the stated clerk normally serves a designated number of years and may be re-elected indefinitely by the presbytery. Additionally, an Executive Presbyter (sometimes designated as General Presbyter, Pastor to Presbytery, Transitional Presbyter) is often elected as a staff person to care for the administrative duties of the presbytery, often with the additional role of a pastor to the pastors. Presbyteries may be creative in the designation and assignment of duties for their staff. A presbytery is required to elect a Moderator and a Clerk, but the practice of hiring staff is optional. Presbyteries must meet at least twice a year, but they have the discretion to meet more often and most do. The General Assembly elects a moderator at each assembly who moderates the rest of the sessions of that assembly meeting and continues to serve until the next assembly convenes (two years later) to elect a new moderator or co-moderator. Currently, the denomination is served by Co-Moderators Denise Anderson and Jan Edmiston who were elected as the first co-moderators of the 222nd General Assembly (2016). At the 223rd Assembly in St Louis, MO, Co-Moderators Elder Vilmarie Cintrón-Olivieri & The Rev. Cindy Kohmann were elected. See a complete listing of past moderators at another Wikipedia Article. The General Assembly elects members of the Presbyterian Mission Agency Board (formerly General Assembly Mission Council). There are 48 elected members of the Presbyterian Mission Agency Board (40 voting members; 17 non-voting delegates), who represent synods, presbyteries, and the church at-large. Members serve one six-year term, with the exception of the present Moderator of the General Assembly (one 2-year term), the past Moderator of the General Assembly (one 2-year term), the moderator of Presbyterian Women (one 3-year term), ecumenical advisory members (one 2-year term, eligible for two additional terms), and stewardship and audit committee at-large members (one 2-year term, eligible for two additional terms). Among the elected members' major responsibilities is the coordination of the work of the program areas in light of General Assembly mission directions, objectives, goals and priorities. The PMAB meets three times a year. The General Assembly elects an Executive Director of the Presbyterian Mission Agency who is the top administrator overseeing the mission work of the PC(USA). Past Executive Director of the PMA is Ruling Elder Linda Bryant Valentine(2006-2015), and Interim RE Tony De La Rosa. Elected in 2018 is Teaching Elder Diane Givens Moffett (2018- ). The average Presbyterian Church has 175 members (the mean in 2013). About 25% of the total congregations report between 1 and 50 members. Another 23% report between 51 and 100 members. The average worship attendance as a percentage of membership is 51.7%. 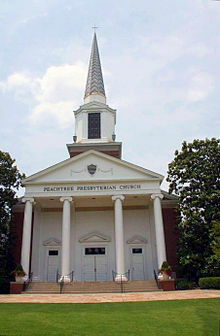 The largest congregation in the PC(USA) is Peachtree Presbyterian Church in Atlanta, Georgia, with a reported membership of 8,989 (2009). Currently, the church supports about 215 missionaries abroad annually. Many churches sponsor missionaries abroad at the session level, and these are not included in official statistics. The church is committed to "engage in bilateral and multilateral dialogues with other churches and traditions in order to remove barriers of misunderstanding and establish common affirmations." As of 2012 it is in dialog with the Episcopal Church, the Moravian Church, the Korean American Presbyterian Church, the Cumberland Presbyterian Church, the Cumberland Presbyterian Church in America, and the US Conference of Catholic Bishops. It also participates in international dialogues through the World Council of Churches and the World Communion of Reformed Churches. The most recent international dialogues include Pentecostal churches, the Seventh-day Adventist Church, Orthodox Church in America, and others. The Presbyterian Church (USA) is in corresponding partnership with the National Council of Churches, the World Communion of Reformed Churches,  and the World Council of Churches. It is a member of Churches for Middle East Peace. The Presbyterian Church (USA) is in corresponding partnership with the National Council of Churches, the World Communion of Reformed Churches,  Christian Churches Together, and the World Council of Churches. Since 1980, the More Light Churches Network has served many congregations and individuals within American Presbyterianism who promote the full participation of all people in the PC(USA) regardless of sexual orientation or gender identity. The Covenant Network of Presbyterians was formed in 1997 to support repeal of "Amendment B" and to encourage networking amongst like-minded clergy and congregations. Other organizations of Presbyterians, such as the Confessing Movement and the Alliance of Confessing Evangelicals, have organized on the other side of the issue to support the fidelity/chastity standard for ordination, which was removed in 2011. The 2006 Report of the Theological Task Force on Peace, Unity, and Purity of the Church,  in theory, attempted to find common ground. Some felt that the adoption of this report provided for a clear local option mentioned, while the Stated Clerk of the General Assembly, Clifton Kirkpatrick went on record as saying, "Our standards have not changed. The rules of the Book of Order stay in force and all ordinations are still subject to review by higher governing bodies." The authors of the report stated that it is a compromise and return to the original Presbyterian culture of local controls. The recommendation for more control by local presbyteries and sessions is viewed by its opposition as a method for bypassing the constitutional restrictions currently in place concerning ordination and marriage, effectively making the constitutional "standard" entirely subjective. In July 2010, by a vote of 373 to 323, the General Assembly voted to propose to the presbyteries for ratification a constitutional amendment to remove from the Book of Order section G-6.0106.b. which included this explicit requirement for ordination: "Among these standards is the requirement to live either in fidelity within the covenant of marriage between a man and a woman (W-4.9001), or chastity in singleness." This proposal required ratification by a majority of the 173 presbyteries within 12 months of the General Assembly's adjournment. A majority of presbytery votes was reached in May 2011. The constitutional amendment took effect July 10, 2011. This amendment shifted back to the ordaining body the responsibility for making decisions about whom they shall ordain and what they shall require of their candidates for ordination. It neither prevents nor imposes the use of the so-called "fidelity and chastity" requirement, but it removes that decision from the text of the constitution and places that judgment responsibility back upon the ordaining body where it had traditionally been prior to the insertion of the former G-6.0106.b. 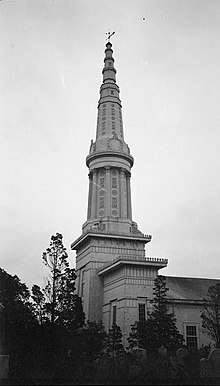 in 1997. Each ordaining body, the session for deacon or elder and the presbytery for minister, is now responsible to make its own interpretation of what scripture and the confessions require of ordained officers. 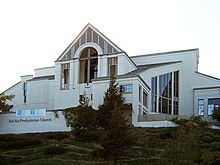 In June 2004, the General Assembly met in Richmond, Virginia, and adopted by a vote of 431–62 a resolution that called on the church's committee on Mission Responsibility through Investment (MRTI) "to initiate a process of phased, selective divestment in multinational corporations operating in Israel." The resolution also said "the occupation … has proven to be at the root of evil acts committed against innocent people on both sides of the conflict." The church statement at the time noted that "divestment is one of the strategies that U.S. churches used in the 1970s and 80s in a successful campaign to end apartheid in South Africa." In June 2006, after the General Assembly in Birmingham, Alabama changed policy ( details), both pro-Israel and pro-Palestinian groups praised the resolution. Pro-Israel groups, who had written General Assembly commissioners to express their concerns about a corporate engagement/divestment strategy focused on Israel,  praised the new resolution, saying that it reflected the church stepping back from a policy that singled out companies working in Israel. Pro-Palestinian groups said that the church maintained the opportunity to engage and potentially divest from companies that support the Israeli occupation, because such support would be considered inappropriate according to the customary MRTI process. ^ "Clerks Corner: Categories of Membership, Defined by the Book of Order G-1.04 - Presbytery of Philadelphia". presbyphl.org. Retrieved December 24, 2017. ^ a b "PC(USA) membership down, financial giving up". The Presbyterian Outlook. June 26, 2006. Retrieved December 24, 2017. ^ "Comparative Statistics". PC(USA). 2005. Archived from the original on March 1, 2003. ^ Marcum, Jack (October 2008). "Go Figure: The Shrinking Church" (PDF). Archived from the original (PDF) on September 14, 2008. Lucas, Sean Michael (2006), On Being Presbyterian: Our Beliefs, Practices, and Stories, ASIN 1596380195 CS1 maint: ASIN uses ISBN ( link). McKim, Donald K (2003), Presbyterian Beliefs: A Brief Introduction, ASIN 0664502539 CS1 maint: ASIN uses ISBN ( link).